The natural form of this species is rarely-seen in aquaria. This one is from Thailand. Subadult specimen of the ornamental pink form. Described from the island of Java, Indonesia but currently accepted to occur throughout much of southern Indochina and the Malay Archipelago including Vietnam (Dong Nai river basin), Cambodia (Mekong), Thailand (Mekong, Chao Phraya, Tapi and Peninsular drainages), Peninsular Malaysia, the Greater Sunda Islands of Borneo (where it’s restricted to western and southern zones of Sarawak and Kalimantan), Sumatra and Java. The extent to which the above range has been modified and extended by humans is unclear. It’s a popular food fish and has been introduced to several countries for aquaculture purposes with feral populations now existing in some places e.g. Florida, United States. The Sarawak population also appears to be non-native with the species having been introduced there during the 1950s (K. A. A. Rahim et al. 2009), and the vast majority of those traded for aquaria are also farmed on a commercial basis in Florida, the Czech Republic, Thailand or Singapore. This species exhibits a preference for slow-moving or standing waters including floodplain lakes, oxbows, backwaters and swamps, and is particularly associated with black and clear water habitats around beds of submerged vegetation. The black water environments are typically associated with ancient peat swamps meaning the water has a negligible dissolved mineral content and the pH can drop as low as 3.0 or 4.0 whereas clear waters normally have less extreme chemistry. Many of its habitats are subject to annual changes in water volume, turbidity and chemistry and it probably moves between permanent waters and temporarily flooded areas during the wet season. Such habitats generally support a wide diversity of fishes. For example in the Batang (river) Kerang floodplain, southern Sarawak, H. temminkii was recorded alongside numerous sympatric species including Anabas testudineus, Luciocephalus pulcher, Trichopodus pectoralis, T. trichopterus, Channa lucius, Trigonopoma pauciperforatum, Cyclocheilichthys apogon, Hampala macrolepidota, Osteochilus hasseltii, ‘Puntius‘ kuchingensis, Rasbora caudimaculata, Pangio semicincta, Leiocassis micropogon, and Carinotetraodon salivator. For long-term care an aquarium with base dimensions of at least 150 ∗ 45 cm is required. Choice of décor is not as critical as water quality and the amount of open swimming-space provided, though it isn’t a recommended addition to carefully arranged aquascapes due to its eventual size and tendency to pick at plant leaves. The addition of some solid surfaces from which the fish can graze biofilm is suggested, with driftwood roots and branches particularly suitable since rocks generally aren’t a feature of its natural habitat. If you do wish to include plants tough, ‘hard-leaved’ genera such as Anubias or Microsorum are best, while floating species also work well. Filtration must of course be efficient but try to avoid excessive flow or turbulence by careful placement of returns and outflows. Adult specimens will produce plenty of waste so weekly water changes of 30-50% tank volume should be considered mandatory. Lighting is relatively unimportant and can be as bright or dim as you prefer, or tailored to any plants being grown, but if possible algae should not be discouraged. Do not fill the aquarium to the top as this species requires periodic access to atmospheric air. This species is a highly-specialised, microphagous filter-feeder and possesses very fine gill rakers as well as modified structures on the gill arches to aid in this process. 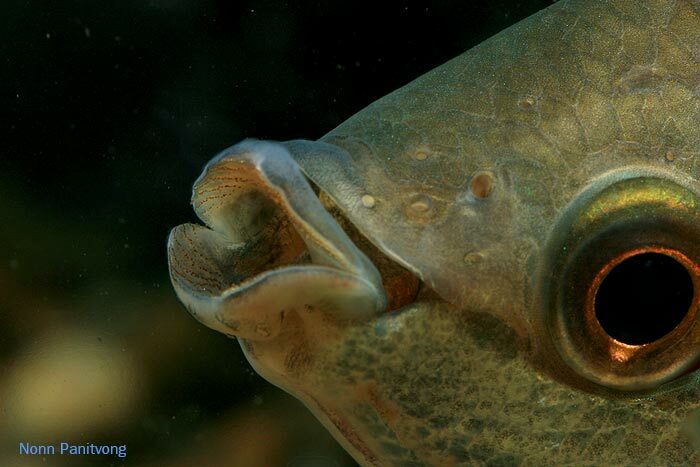 The fleshy lips are also covered in horny teeth which are moveable to a certain extent and used to rasp algae and other microrganisms from submerged surfaces, but there are no additional teeth on the jaws or palate so the fish is largely unable to crush or bite larger objects. 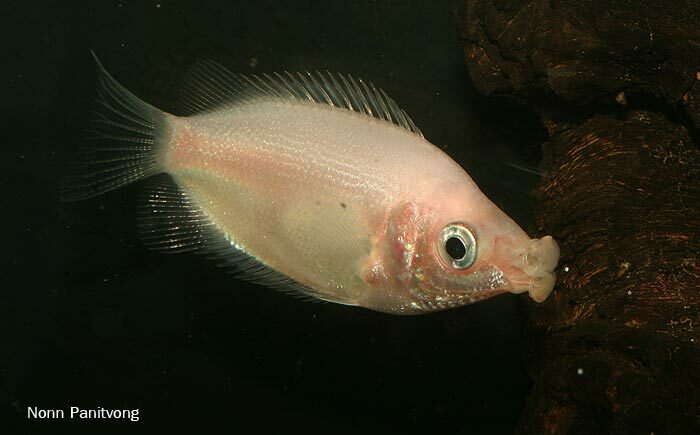 In the aquarium healthy specimens will thus appear to be ‘mouthing’ almost constantly as they draw in water to filter it for food particles and spend much of their time rasping algae-covered surfaces if available. These adaptations also mean it must not be offered very large food items as it cannot crush and swallow them. Most good quality flake foods are fine since they’re soft and easily broken-down, and smaller-grade pelleted products are usually accepted as well. Small live and/or frozen foods such as chironomid larvae (bloodworm), Tubifex, Artemia, mosquito larvae, etc. should also be offered on a regular basis and at least some of the dried products should contain a high proportion of vegetable matter such as Spirulina or similar. Suitable only for the larger community set-up alongside other robust fishes. 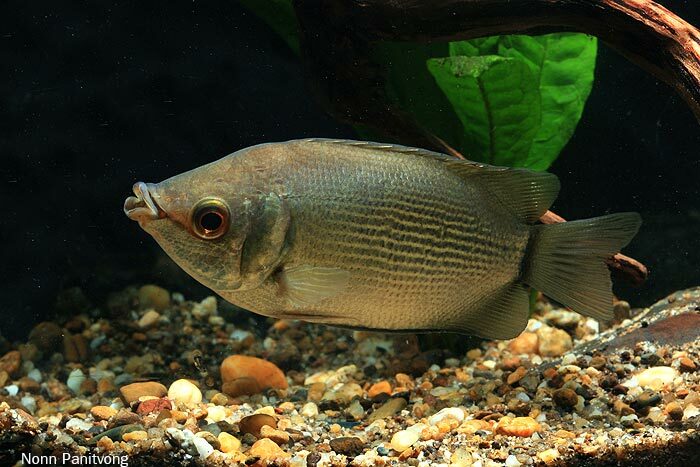 Since it isn’t able to predate anything larger than a few mm in length groups of active, schooling cyprinids can be included and in larger set-ups suitably-sized catfishes, characins, cichlids, mastacembelids and other anabantoids are normally ignored provided sufficient space is available. This species can become aggressive if space is limited, however, meaning similarly-shaped fishes are best omitted in such cases, especially if they’re the same size or larger than the resident H. temminkii. The latter behaviour seems more pronounced in certain individuals and is possibly related to gender. This species is not gregarious except when juvenile but this is not to say you cannot keep a group. Space again seems to be the restricting factor since in smaller aquaria a single dominant individual can literally harass conspecifics to death. Similar problems can arise if introducing new fish to an established specimen or group, so if you wish to keep several it’s best to purchase juveniles and introduce them at the same time, and never buy just two as the stronger will undoubtedly bully the weaker on an incessant basis. Adult females are rounder-bellied than males when full of eggs but otherwise there are no confirmed external differences. 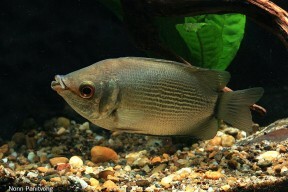 One of the few anabantoids, alongside members of the genera Anabas and Ctenopoma, not to exhibit parental care. In nature it spawns at the onset of the rainy season, apparently tending to move into temporarily flooded zones in order to do so. A single female is capable of producing several thousand eggs per spawning event and these are simply scattered randomly among vegetation. They are buoyant and float during the short incubation period of 24-36 hours with the fry free-swimming after another 48 hours or so. 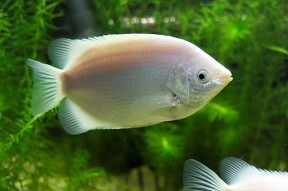 Despite it being produced in significant numbers for both food and the aquarium industry it’s rarely bred by aquarists. This is presumably due to a lack of profitability involved in raising huge numbers of fry with a poor sell-on value and the time required for subadults to become sexually mature, the latter supposedly occurring when they measure around 120-150 mm SL. 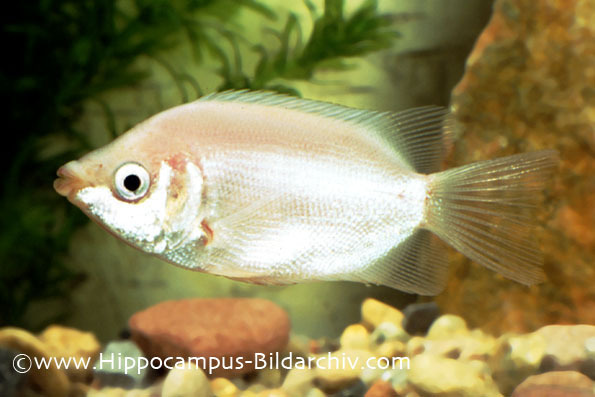 The pinkish-white form of this species is among the most widely-traded aquarium fishes in the world but does not occur naturally and is in fact a leucistic variant bred specifically for ornamental purposes. The ‘short-bodied’ or ‘balloon’ variety also continues to be fashionable but under no circumstances do we recommend the purchase of these intentionally disfigured animals which tend to have much shorter life spans than the naturally-shaped fish. There also exists a less-popular, partially leucistic, ‘piebald’ type while the wild, grey to greenish-coloured form is not often available. 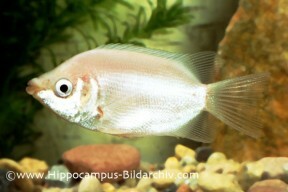 At any rate H. temminkii is not a particularly suitable choice for the majority of home aquaria given its often belligerent behaviour, adult size and life span which can be in excess of 20 years. The relative lack of adults seen in the hobby no doubt reflects these points to a certain extent since thousands of specimens are sold each year but few appear to survive long-term. It does make an excellent ‘pet’ fish though and will learn to recognise its owner over time while displaying considerable character, so is perhaps most recommendable in these terms. The precise function of the ‘kissing’ behaviour that is its major selling point remains unconfirmed but it appears at least in part related to establishment of social dominance and possibly territorial boundaries. It may also be involved in courtship but if so we’ve been unable to establish whether it occurs between rival males, pre-spawning pairs or both. The pink form is sometimes referred to by the invalid name H. rudolfi Machan 1931 which is now regarded a synonym of H. temminkii. The specific name is frequently misspelled ‘temminckii’ or ‘temmincki’, but both these names are considered synonyms of H. temminkii which was the earliest name used and must therefore be accepted in accordance with ICZN rules. The genus has otherwise always been monotypic and is sufficiently different to other anabantoids to be placed in its own family, of which it remains the sole member, but its exact relationship with other anabantoids is still somewhat unclear. It shares an ancestral state (plesiomorphy) with the genus Belontia and family Anabantidae in that the second external levator muscle of the second gill arch is unmodified whereas in all other anabantoid species it is modified into a thin layer covering the entire posterior part of the suprabranchial chamber (Britz, 1995). However Rüber et al. (2006) were unable to categorise its precise position in relation to other anabantoids in their molecular phylogenetic analyses, stating that further study is required and providing tentative “best working hypotheses” that the Osphronemidae is sister group to the Helostomatidae plus the Anabantidae. Like others in the suborder Anabantoidei this species possesses an accessory breathing organ known as the labyrinth. So-called due to its maze-like structure this organ allows the fish to breathe atmospheric air to a certain extent. It comprises paired suprabranchial organs which are formed from the expansion of the epíbranchial (upper) section of the first gill arch and housed in a chamber above the gills. It consists of many highly vascularised, folded flaps of skin the form of which greatly increases the available respiratory surface area. The structure of the organ varies in complexity between species tending to be more well-developed in those inhabiting particularly oxygen-deprived conditions. Histoire naturelle des poissons. Tome septième. Livre septième. Des Squamipennes. Livre huitième. Des poissons à pharyngiens labyrinthiformes. The comparative osteology and phylogeny of the Anabantoidei (Teleostei, Pisces). Labyrinth Fish: The Bubble Nest Builders. Is the name correct? In most webs, including Wikipedia, it is written “temminCKi”. Also in reference 8 bulletin it is written “temmincki”. According to the California Academy Catalogue of Fishes, the species name was spelled temminkii in the original description in 1829. However, it was redescribed in more detail two years later by the same author (Cuvier), who reported that the original spelling was incorrect and that the corrected spelling was temminckii. Since it was the original author correcting a spelling error on the first, the corrected spelling of temminckii should be considered the right one.This correction is within the Rules of Nomenclature.